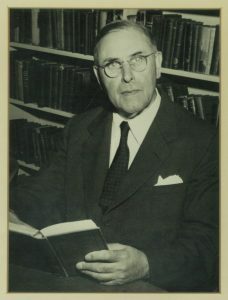 Berthold L. Ullman (1882-1965) received his PhD from the University of Chicago in 1908 and held appointments at the University of Pittsburgh, the State University of Iowa, and the University of Chicago before accepting an appointment as Kenan Professor and Chair of Classics at the University of North Carolina in 1944. His extraordinary energy was legendary, and permitted him to combine scholarly interests in palaeography, medieval and Renaissance literature, the transmission of classical texts, and Latin poetry on the one hand with, on the other, publication of a popular series of elementary Latin textbooks. For a more detailed account, see here. The B. L. Ullman Memorial Fund was initially established by Professor Ullman’s friends and colleagues. It is used to support a wide range of department activities and initiatives. In recent years we have used Ullman funds to recruit new graduate students, award travel grants to graduate students, fund department promotion and outreach to undergraduates, support our program of visiting speakers, and host commencement celebrations for our graduating students. Please consider making a gift online to the B. L. Ullman Memorial Fund (101151).